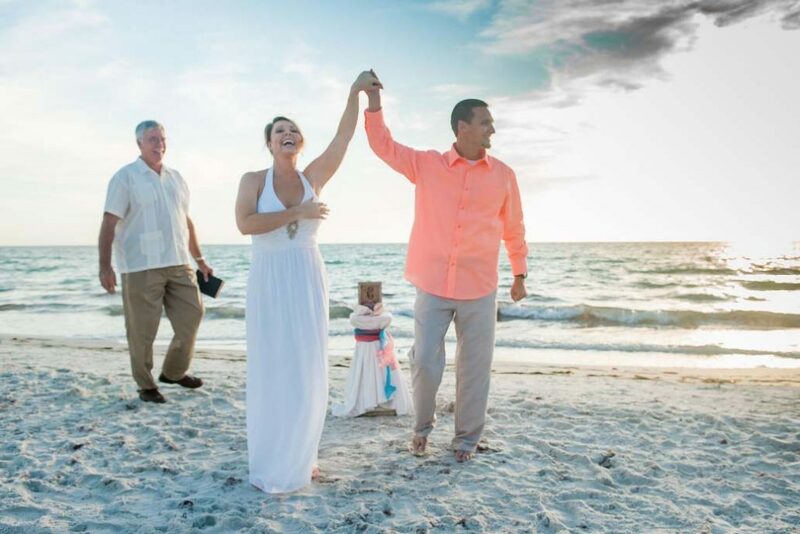 Affordable Florida beach weddings needn't mean compromise. With Suncoast Weddings, budget-friendly does not mean taking second best. Our Toes in the Sand package is intimate and affordable. This package is for couples only (no guests except children). A popular choice for elopements and vow renewals. Minimalist, no fuss, just pure romance. The beauty of a Florida beach with the soundtrack of the waves, no complications, no stress, just love. Professional wedding minister - our ministers work within the church and can perform either a religious or non-religious ceremony. You are also welcome to incorporate your own vows. All photo images - uploaded to an online photo album that can be shared with family and friends. Images available for download and also the ordering of prints, canvas wraps, albums. Filing of your marriage license or for those couple renewing their vows, you may request a keepsake certificate. Depending on the location chosen, an additional permit fee may be required. We can help advise what options are available and any fee will be added on to your ceremony proposal. If you love the beach and are ready to start planning, give us a call (727-443-0039) or drop by our office in Treasure Island.